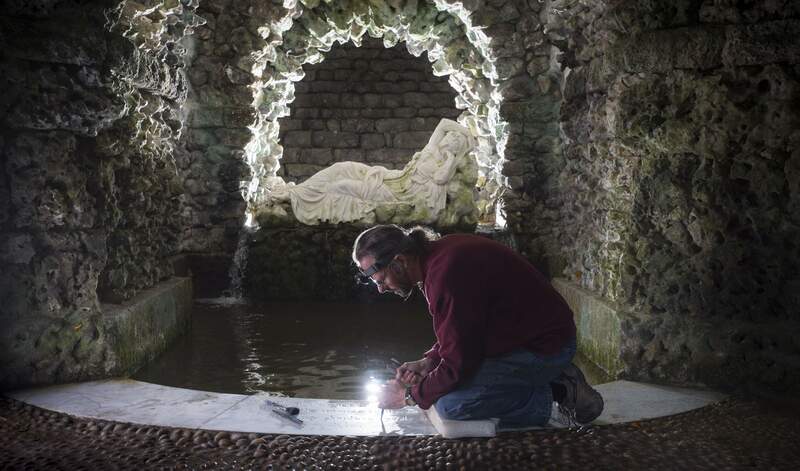 Pictures By Steven Haywood – Restoring the Alexander Pope inscription in the Grotto at Stourhead for the National trust, with Cliveden Conservation Workshops. I recently completed a restoration project for the National Trust at Stourhead, working with Cliveden Conservation Workshops. 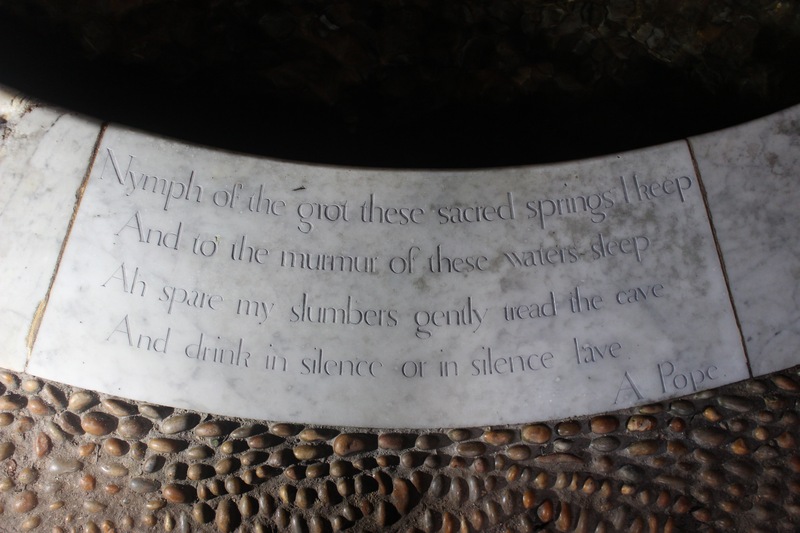 The inscription in the grotto had become illegible as people had worn away the last line of the Alexander Pope poem as they approached the spring. The project involved re-cutting the letters and giving them a sensitive colour wash to aid legibility. I spent four days on my knees in the dark damp cave, carving into the white marble slab. The lettering is a quite unusual sans serif form with a big variation in weight; ‘V’ cut for the narrow forms and flat bottomed for the thicker forms. The letters were the inspiration behind the National trust’s first bespoke typeface in 2009. On day three the photographer Steven Haywood took some publicity shots for the Trust. This involved me donning chest height waders and kneeling in the icy waters so Steven could get a shot of the carving with the statue of Ariadne as the backdrop. This has been a challenging and unusual project! And drink in silence or in silence lave. 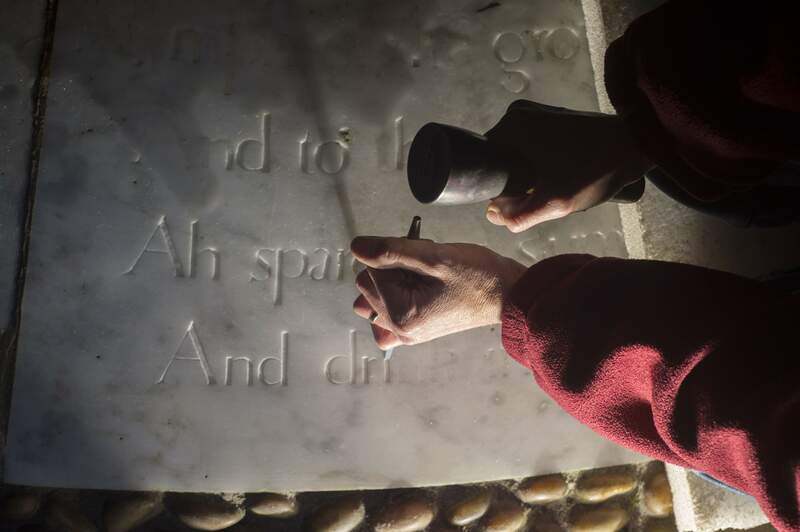 Restoring the Alexander Pope inscription in the Grotto at Stourhead for the National trust, with Cliveden Conservation Workshops. 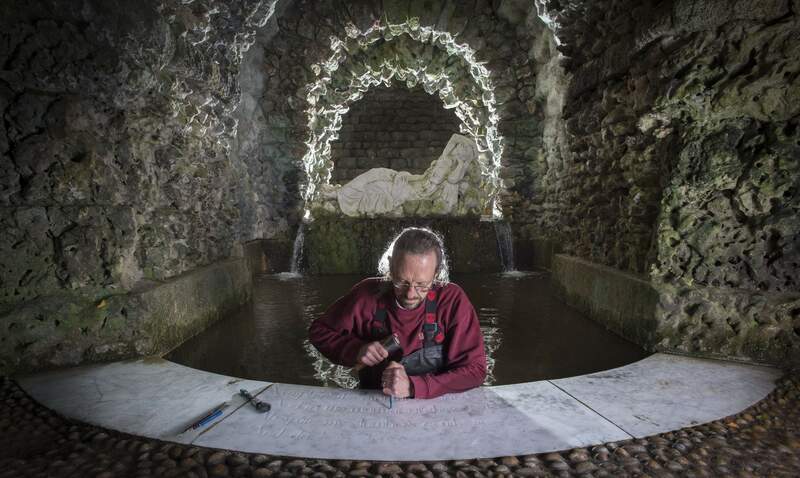 This entry was posted in letter cutting, lettering restoration and tagged Alexander Pope, Cliveden Conservation, Grotto, Iain Cotton, lettering restoration, National trust, Steven Haywood Photography, Stourhead by iaincotton. Bookmark the permalink. Nicely legible now. Great time to visit too with all the Autumn colours! 10-28-12calin spune: buna am si eu o problema cu munitoruil am win7 proffesional si mi se stinge munitorul la unele jocuri wow mt2?? ?care e problema?? ?si cand se stinge scrie ac olo power saving mode dar unitatea merge si munitorul nu mai me:e(r(g!! !sper sa ma ajutati -3V-a ajutat acest raspuns?